Complimentary Pizza at 11:30am every Friday! Join us this Summer – Improve your game and have a BLAST! Novice, Beginner, Intermediate and Advanced players, and High School age. Come to our tennis camp to improve their tennis skills and have fun. We offer excellent tennis instruction to help every player excel, we have a match play and/ or tournament to show our skills and to have fun. We’ll warm up and condition each day before we start our drills. Everyday campers participate in a variety of planned games and drills. The Tennis camp will run weekly from June 10th to August 23rd. Please bring snack & water daily. Sibling Discount:Use the coupon code “SIBLING” at checkout. Improve your game and have a BLAST! Claude Confort’s TENNIS PRO ZONE Camps will help you acquire better skills and a renewed enthusiasm for the game. 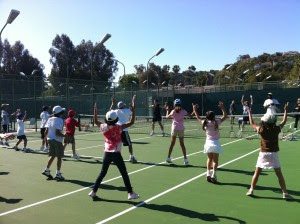 Each camp provides young players with the opportunity to become better tennis players in a fun, positive environment. You’ll never be the same after attending Tennis Prozone Summer Camp… not only because of the expert training that’s sure to help you reach your full potential,but for the pleasant summer memories that will last a lifetime. Tennis is the game for a lifetime. Once a child learns to play tennis he has received a gift that cannot be taken away. More than just tennis skills, the importance of sportsmanship can and should be carried through life on and off the court. Camp is an experience that will enrich the life of a child; will give him a valuable skill, will enhance his self-confidence and provide lifelong memories. Every young person deserves an opportunity to learn a lifetime sport. Tennis Prozone Summer Camp provides this, where camaraderie and understanding will develop along with his tennis skills and love for the game.